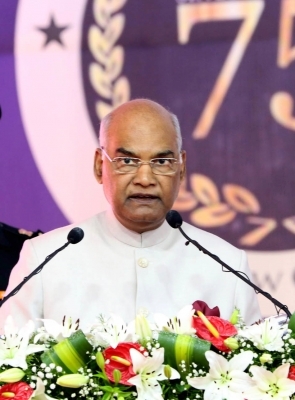 Belagavi (Karnataka) Sep 15 (IANS) With the time span between innovation and its application shrinking President Ram Nath Kovind on Saturday called upon lawyers to respond quickly as disruptive technology threw up challenges for the legal fraternity. "As time span between innovation and application is shortening it poses challenges for law in genetic engineering bioethics and artificial intelligence. Lawyers have to respond quickly. I hope our legal minds will put their thoughts into it a said Kovind here in Karnataka s northwest region about 500 km from Bengaluru. Inaugurating the platinum jubilee celebrations of the Karnataka Law Society (KLS) and Raja Lakhamgouda Law College Kovind said in the age of technology and entrepreneurship the fourth Industrial Revolution (4.0) was changing how people live and work and the aspirations of the younger generation. "Our educational institutions have to become compatible with this quest for innovation and excellence. They have to become compatible with the 21st century " he asserted. Terming the law humans wrote was the basis of civilisation for discipline and orderliness the President said even lawyers and judges were seekers of truth. "That is why so many lawyers were part of the national movement. Mahatma Gandhi and Babasaheb Ambedkar were both lawyers with a spirit of public service. The Constitution is a modern scripture of our national identity " Kovind recalled. Hinting that India was in the midst of dramatic changes the President said decisions being taken would influence not just in the near future but the rest of the century. "We have young and talented population and an economy brimming with opportunities. In the previous quarter the GDP grew at 8.2 per cent which indicates the pace and our potential. We live in an age of technology and of entrepreneurship " he reiterated. With the overhauling of the regulatory framework for higher education and upgrading it to meet the present needs the President said graded autonomy was granted to 60 top universities across the country. "In addition 20 institutions of higher education have been promoted as institutes of eminence which enable them to recruit faculty and revamp the curricula for achieving global standards " added Kovind. Besides Karnataka Governor Vajubhai Vala and Chief Minister H.D. Kumaraswamy Supreme Court Chief Justice Dipak Misra and Attorney General K.K. Venugopal an alumni of the college participated in the function.